Musicianship aside, the true beauty of this collection lies in its spirituality: Trevor’s lyrics speak of God’s mercy, love, freedom and forgiveness. Already well known in contemporary Christian music circles as a superb songwriter, Trevor got the producer and musicians he needed to create a recording that does justice to his excellent compositions. Featuring a polished, guitar-driven rock sound-from straightforward, classic rock tunes to moody, beat-driven numbers-and Trevor's distinctive vocals, Eyes to You is as good as it gets. Trevor recorded the album in Los Angeles at a studio that has hosted the likes of Eric Clapton, Keith Richards, No Doubt and Ryan Adams. Throughout production he worked alongside masters of the industry and some of the most sought-after musicians in the L.A. music scene, including the renowned Josh Freese (A Perfect Circle, The Vandals) on drums, Michael Ward (The Wallflowers) on guitar, and Kevin Stoller (Stevie Nicks) on the Hammond B3 organ. The result is an album that has gained the respect of both the Christian and mainstream music industries. Musicianship aside, the true beauty of this collection lies in its spirituality: Trevor's lyrics speak of God's mercy, love, freedom and forgiveness. The title track calls us to acknowledge our distractions, fears and failings, then turn and fix our eyes on Jesus. When we do this, we begin to see Christ in every facet of our lives. But it also refers to God, whose eyes are turned to us, full of love and mercy. Other highlights include "Freedom," "Healing Waters" and "The Return." Between the release of this hot album and his aggressive touring schedule, a lot of eyes are on this super-gifted musician right now, and deservedly so. Already well known in contemporary Christian music circles as a superb songwriter, Trevor was joined by the producer and musicians he needed to create a recording that does justice to his excellent compositions. 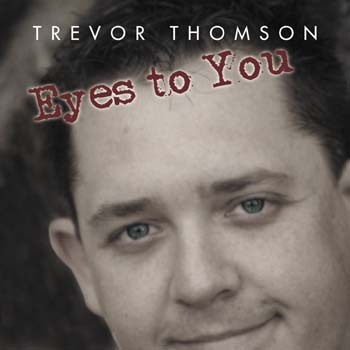 Featuring a polished, guitar-driven rock sound—from straightforward, classic rock tunes to moody, beat-driven numbers—and Trevor’s distinctive vocals, Eyes to You is as good as it gets.